All funds raised will go directly to Coalition To Stop Violence Against Native Women . All the money raised for these t-shirts go directly to the Coalition to Stop Violence Against Native Women. There are three shirt styles and two different colors to choose from. January's Daring to Rest podcast featured the story of Dr. Nicole Bowman, a Native American woman, telling her powerful story of how the Daring to Rest yoga nidra program and community has changed her life over the past year. We were so moved by Nicky's story and the intergenerational trauma she spoke of on the podcast amongst so many indigenous communities that we decided to create this fundraiser to raise money for the Coalition to Stop Violence Against Native Women. We are focusing on violence against Native Women because, according to a new study, "An alarming number of Indigenous women and girls disappear or are murdered each year." The report identified 506 cases across 71 cities. There's a critical gap in measuring just how many, but what we do know is that 84% of Native Women experience violence in their lifetime. Your t-shirt purchase support's the Coalition to Stop Violence Against Native Women's mission "to stop violence against Native women and children by advocating for social change in our communities." This fundraiser is presented by Daring to Rest. We imagine a well-rested world and our mission is to help women be the guides to take back rest using the "rest medicine" of yoga nidra meditation. We believe yoga nidra is a peace practice. The more people practice yoga nidra, the more there will be peace in the world. *Thank you to Dani Ebert for the t-shirt design! Tipi support women and the coalition to stop violence against Native American women. Because it is so important for Women to support each other, and Violence is not acceptable. Peaceful rest is so important to the entire body system. This is ancient wisdom that needs to remembered. Rest heals your body. When we can sleep in peace we can lead a generation out of the darkness! Resilience is a process and rest can revitalize and reset. No more MMIW! Thank you for doing this! This issue has fallen through the cracks for too long. We can, and should, do better. 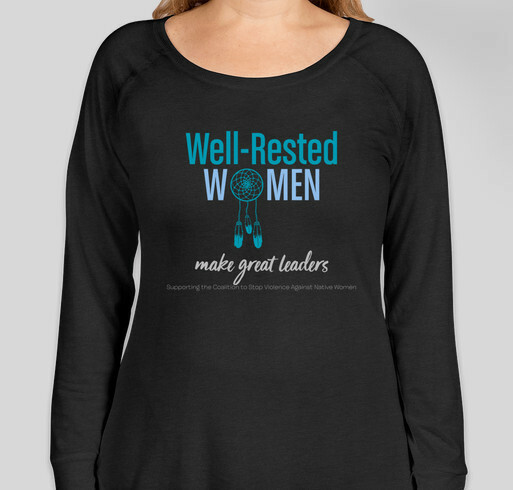 Share Why You Support "Well-Rested Woman T-Shirt: Support the Coalition to Stop Violence Against Native Women"